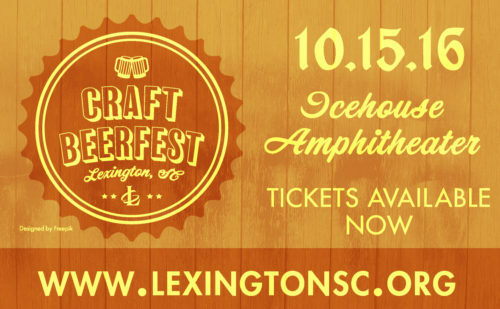 On October 15 at 6 p.m., The Greater Lexington Chamber and Visitors Center will host the Lexington Craft Beerfest to celebrate the grand opening of the town’s newest project, the Icehouse Amphitheater. The Lexington Craft Beerfest will feature over 50 regional craft beers, cuisine from local restaurants and live music by 20 RIDE. Tickets are $30 in advance and $40 the day of the event and include entry into the festival and beer samples. Food tickets will be available for purchase inside the festival. Currently seeking volunteers for the 8:00-10:00 p.m. shift. Volunteers will either be pouring beer or distributing water/soda to the attendees. Volunteers for this shift are welcome to come enjoy the event prior to their shift start time. Those interested should contact Sondra Gettys, VP IOM, at [email protected] or (803)359-6113 ext.104.